The Kanomax 6113/ 6114 Multifunction Anemometer w/ Printer simultaneously measures air velocity, temperature, and pressure (optional) . Featuring an optional built-in printer and instantaneous storage of up to 100 readings, the Kanomax 6113 makes it simple to keep record of measurements. The Kanomax 6113 is also available without the built-in printer as the Kanomax 6114. The Kanomax 6113/6114 features probe compatibility and an RS-232C output terminal. Calibration probe compatibility feature allows the utilization of a spare probe, making the meter a very versatile option. 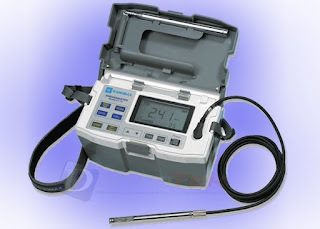 The Kanomax 6113/6114 Multifunction Anemometer w/ Printer is suitable for measurements inside ducts. The Kanomax 6113/6114 has a large, easy to read graphic LCD, operation is simple with designated buttons for printing and calculation. The Kanomax 6113 quickly calculates maximum and minimum values, averaging while displaying raw data. The 6113 displays a variety of measuring units ( m/ s, fpm, Celsius, Fahrenheit, kPa) and can hold a measured value. 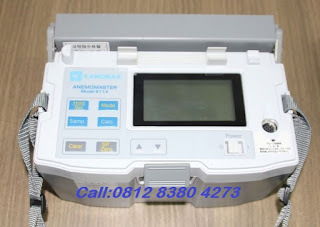 The Kanomax 6113/ 6114 Multifunction Anemometer w/ Printer ships complete with meter, probe with cable, manual, 6 x 1.5V C cells, extension rod, shoulder strap and printer ( 6113 only) . Measuring Functions: Settings: Display hold, time constant setting ( 1, 5, or 10 sec.) , remaining battery life ( 5 steps) , measuring unit setting ( m/ s, fpm, Celsius, Fahrenheit, kPa) . ; Data Storage: 100 Measurement Data; Calculation : Maximum and minimum values, averaging, raw data display; Display : Calendar function, air velocity bar graph display. Darmatek is Kanomax 6113 / 6114 Multifunction Anemometer w/ Printer Sales Online Shop, survey tool. We are here as a Supplier of land or building survey equipment, telecommunications survey tools, geological surveying or mining tools, and other survey tools including Total Station, Digital Theodolite, Automatic Level, GPS, Compass, Binoculars, Monocullars, Laser Rangefinders, Night Scope, Digital Altimeter , Clinometer, Tandem, Digital Planimeter, Distometer Speed ? ?Gun, Measuring Wheel, Measuring Tape, Grounding Tester, Handy Talky HT, Sound Level Meter, and Geological tools, PH Meters, Lux Meters, Anemometers, Thermohygrometers, Thermometers, Sirens, etc.